It was 5:12am, local time on April 18, 1906, when residents of the San Francisco Bay area in California experienced major shaking. 20-25 seconds later, they learned the hard way that that shaking was nothing compared to what they would experience for the next 45-60 seconds. The epicenter of the 7.7 – 8.25 quake was about 2 miles from the city of San Francisco, in Mussel Rock, but shaking was felt from Oregon to Los Angeles and as far inland as central Nevada. The first shaking was merely a foreshock to what was to go down as one of the worst natural disasters in the history of the United States alongside two hurricanes – the Galveston hurricane in 1900 and Hurricane Katrina in 2005. The earthquake was caused by a northward and southward rupture of 296 miles on the northern third of the San Andreas Fault. A major aftershock occurred at 8:14am, sending survivors into a panic and causing the collapse of already damaged buildings. At noon, two earthquakes occurred in Los Angeles about ten minutes apart just as large crowds were gathering around bulletin boards for the latest telegraphic dispatches from San Francisco. Thousands of people ran screaming in panic. 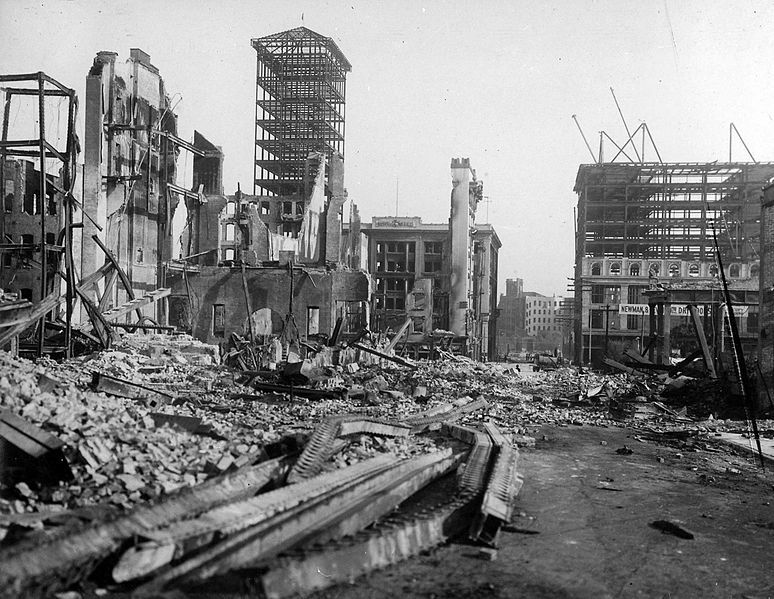 Although San Francisco is the most famous city affected by the earthquake of 1906, several other cities suffered considerable damage including San Jose and Santa Rosa, whose entire downtown was essentially destroyed. 80% of the city of San Francisco was completely destroyed. Out of a population of 410,000, between 250,000 and 300,000 people were left homeless. Damages were calculated at about $400 million in 1906 which would be equivalent to about $10 billion today. The really funny part (or tragic, depending on how you want to look at it) is that it’s estimated that about 50% of the buildings that were destroyed wouldn’t have been except that firefighters were using dynamite to demolish certain buildings in an attempt to create firebreaks. Aside from then destroying those buildings, this, unfortunately, resulted in new fires being started by the explosions, which then spread throughout the city. In addition to that, one of the largest fires of the disaster was started accidentally by a woman making breakfast for her family, which came to be known as the “Ham and Eggs Fire”. It went on to destroy part of the Western Addition, the Mechanics’ Pavilion, City Hall and then jumped to Market Street at Ninth. At the time of the disaster, San Francisco had been the ninth-largest city in the United States and the largest on the West Coast of the country. Over a period of 60 years, the city had established itself as the financial, trade and cultural center of the West, operating the busiest port on the West Coast, making it the “gateway to the Pacific”. Though San Francisco was rebuilt very quickly, with the quickness in part thanks to the efforts of the founder of Bank of Italy, which became Bank of America, A.P. Giannini, it was too late. (Incidentally the character of “George Bailey” on “It’s a Wonderful Life” was based off Giannini, who was a truly remarkable individual). Directly after the earthquake happened in the very early hours of the morning, Giannini went and sifted through the rubble of his building and gathered $2 million into a garbage man’s wagon, owned by Giobatta Cepollina whose son would go on to work for Bank of America because of a promise made by Giannini to Cepollina in exchange for use of his wagon. Cepollina’s son was able to retire from Bank of American at 41. After gathering the money, Giannini then took it outside of town, covered in garbage to protect it from being stolen. Next, he headed out to the docks and setup a temporary bank with two barrels and a piece of wood as his desk. He then began taking deposits and giving loans to help not only businesses, but also the working class, so that they’d have the money they needed to rebuild their homes and their lives as quickly as possible. At that time, none of the other banks had re-opened and most did not do so for several weeks, so few who kept their money in banks had access to it and many others had lost everything in fires. Giannini also immediately sent two ships to Washington and Oregon to acquire large amounts of lumber to try to work around the inevitable materials shortage that he foresaw. That lumber he sent for comprised most of the lumber available in the early stages of rebuilding San Francisco. Despite the efforts of many to help rebuild San Francisco quickly, the disaster diverted trade, industry and population growth south to Los Angeles which quickly became the dominate city in California. Many of the city’s leading poets and writers also retreated to the established arts colony, Carmel-by-the-Sea. Although the majority of the largest botanical collection in the western United States was consumed by fire after the earthquake, Alice Eastwood the Curator of Botany at the California Academy of Sciences in San Francisco, is credited with saving nearly 1,500 specimens, including the entire type specimen collection for a newly discovered and extremely rare species. Benjamin R. Jacobs, a biochemist who was researching the nutrition of everyday foods was not as lucky. His records and entire laboratory were destroyed by fire as was the original California flag used in the 1846 Bear Flag Revolt at Sonoma. In 1906 it was being stored in a San Francisco state building. I learnt years ago that the famous singer of the time Mario Lanza was in San Francisco at the time of the earthquakes. He was unharmed but swore he would never go back to the city. He kept his word. You mean Enrico Caruso. He sang just hours before the earthquake, and the audio from this has recently been digitally restored! p.s. Mario Lanza was born in 1921. Thanks, stu – you are absolutely right. Shows how a distant memory can be corrupted over time. I wish you folks would realize that many, perhaps most, of your readers are older folks and the light print of the “quotes” is very hard to read. If I care enough, I have to enlarge it a lot, or copy it into my word processer and make it black. Mostly I just skip it. You can hit Ctrl-A and this will highlight all the text on a webpage with blue background and white letters. I use this when I can’t make out text due to poor color usage or page formatting. This is a lot easier than what you’ve been going through!